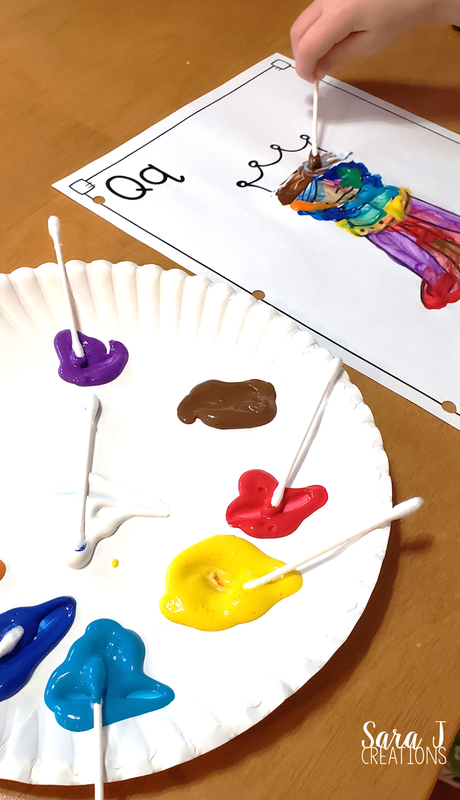 Preview: Letter Q Activities that would be perfect for preschool or kindergarten. 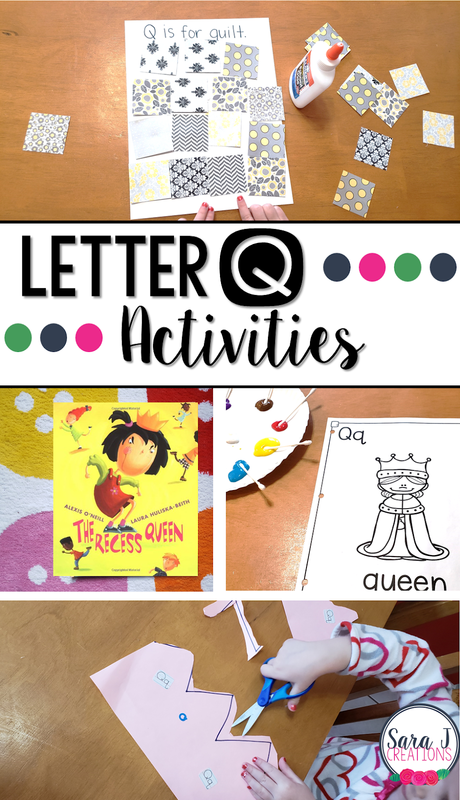 Art, fine motor, literacy, and more all rolled into Letter Q fun. This week in our weekly alphabet study is the letter Q activities. Q can be tricky since there aren't a ton of common words that start with q, but we managed to have some fun with quilts and queens. We had some handwriting practice, literacy fun, art projects, and fine motor practice. To start our study of the letter Q and a week of fun activities, we read the book The Recess Queen by Alexis O'Neill. We talked about how the word pig starts with Q. Then I showed my daughter what a Q looked like in the book and we searched for other Q's. I made sure to pick a book that matched the picture that we would create next for our alphabet art book. For the alphabet book we are working on, we added Q is for Queen. We used Q Tips and Crayola washable paint to paint the queen. This was great fine motor practice too as she dotted and then smeared using the Q Tips. The alphabet book is part of my Alphabet Centers with Real Pictures. To practice writing the letter Q, I put our alphabet tracing sheets in a reusable plastic sleeve and gave her a dry erase marker. Now that we are in our routine, she easily works on this and the letter identification task without any help or prompting from me. I just leave it on the table and she knows what to do. We also pulled out our What's the Letter Pages from our Alphabet Practice pack to practice tracing and identifying the letter Q. We practiced identifying the letter Q in all different fonts with our Q page from our Alphabet Centers pack. We kept out our Q Tips and washable paint to color in the letter Qs on the page. This was a nice change from our dot markers that we usually use. We also got out our sticker chart and added the letter Q. Then I gave my daughter a bunch of sheets of old scrapbook letters and she went through them to find the letter Q and put it in the right column. For some fine motor practice I made a crown on a piece of paper and had her find Q stickers to add to the crown. Then I gave her scissors and let her practice cutting along the line. She has used our Cutting Box since she was little so she very comfortable with scissors but a little extra practice never hurts. For another Q craft, we worked on making a quilt. I took old scrapbook paper and cut it down to 2x2 squares. Then I wrote Q is for Quilt at the top and gave my daughter the glue. I wanted her to practice using just a dot of glue and squeezing the bottle on her own. She did a great job squeezing glue and deciding what paper to use to design her quilt.